Lucky Nugget is quite generous in its offerings. All players here can access a variety of playing incentives. There are a series of daily, monthly, and weekly bonuses. As if this is not enough, players have a chance to join their loyalty rewards program, which offers redeemable points based on one’s activity levels at the casino. Players at Luck Nugget are served with 500 + games, which essentially means that there are no limits to the amount of fun enjoyed at the casino. Slots fans are supplied with a vast collection of slots games, including progressive jackpots. Table games fans are also served with games such as Baccarat, Craps, Keno, and roulette variants. Lucky Nugget has partnered with Microgaming, a leading gaming software developer. This means that players are assured of amazing gaming options. Another benefit realized from working with Microgaming is the variety of games, more than 400, which are all of high quality. The software is available as downloadable or instant play version. When it comes to making payments, Lucky Nugget’s players can use a variety of options. Some accepted deposit options offered here include prepaid cards, credit cards, bank transfers, and e-wallets among others. The SSL data encryption technology secures all deposit options, which implies that both your personal or bank details are kept safe while making deposits. It is straightforward to claim winnings at Lucky Nugget. However, withdrawal times depend on the withdrawal method chosen. Some of the withdrawal options offered at Lucky Nugget include eChek, InstaDebit, MasterCard, Skrill, and Neteller. The withdrawal option list is quite extensive, only that some options are not set up for all regions or countries. Lucky Nugget is open to players from numerous countries. To keep the players engaged, this Lucky Nugget's website is available in many languages, which are English, French, German, Swedish, Greek, Spanish, Dutch, Russian, Norwegian, Finnish, Japanese, Italian, Portuguese, and Danish. By all standards, these language options are more than enough. Lucky Nugget offers its players a wide variety of currency options. This casino accepts the US Dollar, Australian Dollar, Canadian Dollar, New Zealand Dollar, British Pound, Swiss Franc Japanese Yen, Mexican Peso, Argentinian Peso, Russian Rubles, Indian Rupees, and the Norwegian Kronor. Players are at liberty to use any of these options as their primary account currency. 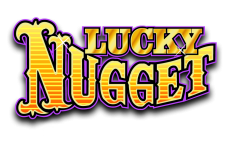 Lucky Nugget offers punters with a fantastic opportunity to enjoy a massive library of casino games. Both iOS Android users are served with a downloadable mobile app. Players who are not comfortable with downloadable options are not excluded to the gaming action. The instant play platform makes the casino playable of computer and smartphone browsers. To ensure players feel confident and comfortable at the casino, Lucky Nugget has a team of professional multilingual customer support staff. Players can contact the support team using the live chat feature, toll-free phone numbers, and email. The support team is very accessible and is available 24 hours a day, seven days a week.